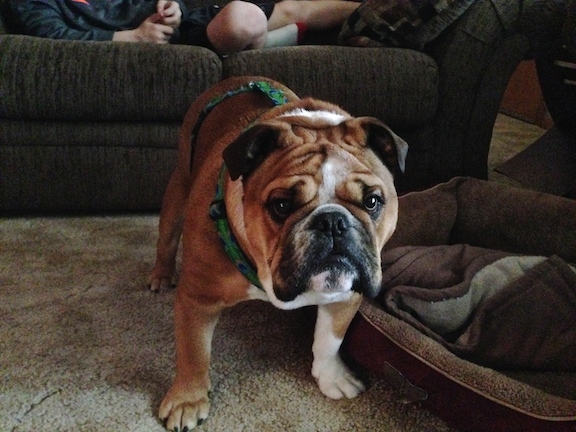 Radar is a one-and-a-half year old English Bulldog who has become increasingly aggressive to people he doesn’t know or disagrees with. His owners reached out to me after Radar nipped the family’s 10 year old boy. Radar was not happy with my arrival and made it clear with a lot of barking and some posturing. I had expected this so I had adopted an assertive body posture, made sure I kept him in front of me and did not back away or react to his barking. At first I simply stood my ground at the back door while I stood in the kitchen and observed Radar. His head was lowered and he was making a lot of intermittent eye contact, but he consistently moved backwards each time he barked at me. It was a slight movement, but enough for me to see and indicated that he had some insecurity. I moved forward in a confident and deliberate movement making sure that I kept my hips and shoulders squared up. His owners had informed me that they didn’t have many houseguests due to his behavior. This lack of practice at the proper way to greet a human was glaringly apparent. I continued to move forward after each bark, pausing between each step to gauge his reaction and behavior. Radar consistently moved backward this way one bark and step at a time. Once I moved him from the kitchen to the living room, the father of the family tried to get between the dog and myself while attempting to verbally reassure Radar saying, “Its alright. Everything is ok.” I gave him an opportunity to correct Radar but his attempts were largely ignored by the dog. After the fifth time that I heard him say “its alright” to Radar I asked him, is this behavior, in fact, alright? His owner immediately recognized that what he was saying wasn’t appropriate for the situation, but I pushed the point for a moment. While he acknowledged that things were not alright, the fact that he kept saying it was ok underscored a part of the problem. We cannot rationalize with a dog when its in an unbalanced state of mind, and often humans unconsciously attempt to convince themselves things are better than they are. Now Radar’s owner was not at all delusional that this behavior was acceptable. He has done a really good job in many areas, but recognizing what he was saying out loud is the first step towards changing both the owner and dog’s behavior. As I had this discussion with his owner I kept my eyes fixed on Radar as the best chance to get bitten from an insecure dog in this type of situation is when you drop your attention from them while they are all worked up. Radar continued to bark at me so I continued to step towards him which caused him to continue to back away. After I got a few feet into the living room, Radars barks took on a less intense tone. He continued to bark, but eventually recused himself from the situation – walking around a couch and standing under an end table on the far side of the room. Only after Radar turned away and walked away did I come into the room and introduce myself to the members of the family. Radar’s barking had dropped a bit in frequency and intensity, but he kept at it. After discussing the situation with his owners for a few minutes, it was clear that their lack of rules, boundaries and structure combined with an abundance of attention and affection for no reason had given the dog the idea that he was in a leadership position. His owners had been yelling at him to be quiet with little success. I explained that when a dog is barking and we yell at them, they often interpret that as our agreeing with their barking. Then I went on to show them some non verbal modes of communication using body language, eye contact, movement and timing. Within a few moments they were successfully using these new forms of communication to disagree with his behavior and barking. As they did, Radar’s energy level started to drop. He was still clearly not happy I was there, but his stiffness, barking and eye contact all improved dramatically as the session went on. It will be important that they continue to uses these new communication methods and apply them as soon as Radar starts to bark, protest or engage in unwanted activities or behavior. Its much easier to get a dog to stop or calm down if you disagree with them as soon as they start. Usually it takes most of the session before my clients develop the proper timing of their corrections, but Radar’s family picked it up within the first 20 minutes. The fact that it worked so effectively combined with their desire to curb this aggressive behavior was already paying dividends. I went over some new ways of petting the dog that will help change the leader follower dynamic as well as some rules that will help Radar start to assume more of a follower position in the home. I also suggested that they practice a leadership exercise to help accelerate the transformation in the leadership dynamic in the home. This exercise is easy to master and affords the family the ability to gradually make it more challenging. This gives the dog the ability to practice deferring to their authority. Radar isn’t a bad dog, he just got the wrong impression of what his family wanted from him. Because this territorially aggressive behavior has only been going on since Thanksgiving, it shouldn’t take too long for him to give it up. It will take regular enforcement of the new rules and complete adoption of the new communication methods before they are able to eradicate this behavior for good. But based on how quickly the members of the family adopted the new methods, they should see a gradual change in his attitude, behavior and respect for their commands and authority.